What’s the Best Ever Chocolate Chip Cookie Recipe Secret Ingredient? Everybody always asks for her cookie recipe, but she never gave it out– until now! I’m not saying it’s because I’m her favorite child or anything, but I’m just saying. ? How can a cookie be light and airy, but dense and chewy in the middle, and lightly crisp around the edges?! I don’t know!! But these cookies really are! If you’ve ever made meringue before, it’s the ingredient that helps to keep it light and airy. It’s exactly what it does for these chocolate chip cookies too. I’ve never had a cookie like my mom’s chocolate chip cookie, anywhere else! She also sifts her flour multiple times, to make sure the flour has a perfect consistency, but it’s completely up to you how many times you want to sift. 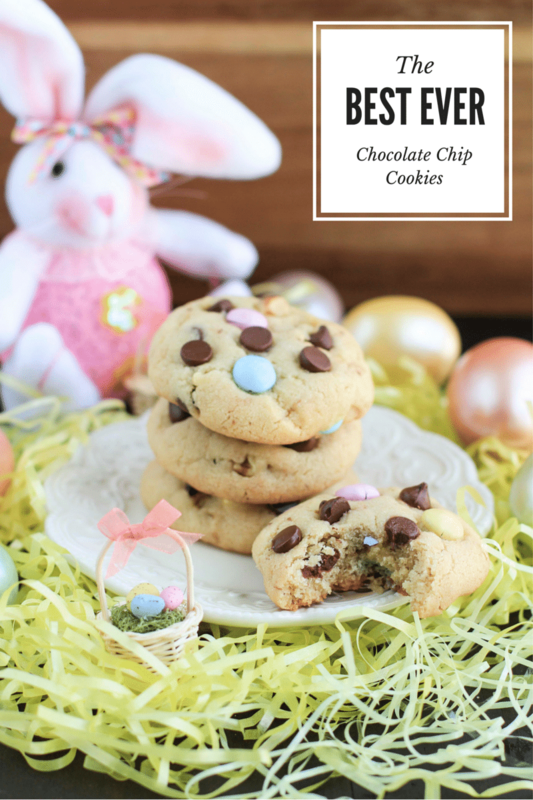 Once you try my mom’s recipe, you’ll never need or want another chocolate chip cookie recipe! 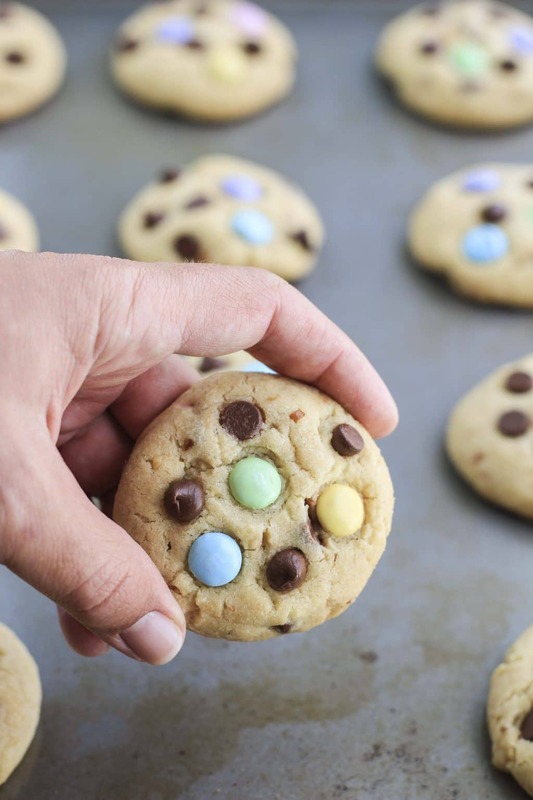 Whenever my mom makes these chocolate chip cookies for holidays, she always adds holiday themed M&M’s® in addition to the chocolate chips, to make them look extra festive. For Christmas, she uses red and green M&M’s® and for Halloween, she uses orange, white, and yellow M&M’s®, so it resembles candy corn. 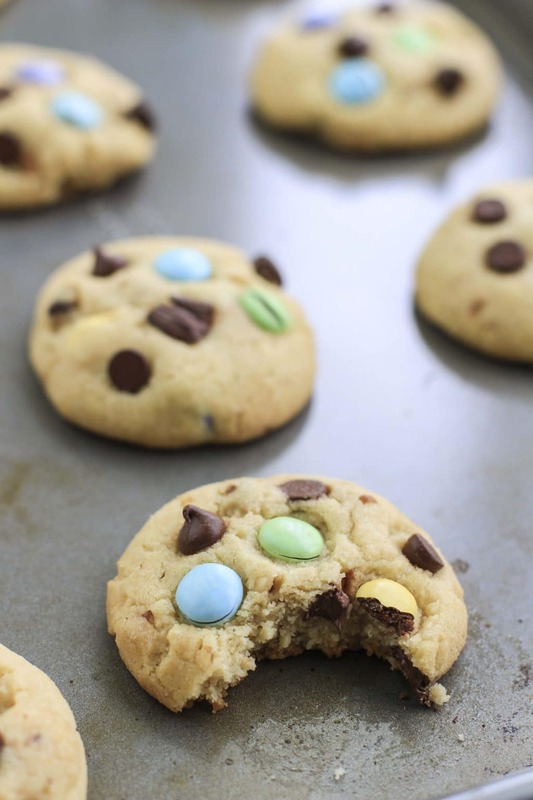 Of course for Easter, she uses M&M’s® Pastel to make her chocolate chip cookies look extra spring-like! My mom and I both love Easter– all the flowers, baby animals, springtime, the beautiful weather, and especially the azaleas that bloom at my parent’s house in the side yard. When Easter is early, like it is this year, the azaleas stay in bloom through the holiday. The bright pink and purple flowers are such a pretty background for Easter pictures! When we were little, my dad always dressed up as the Easter bunny on Easter morning. My mom would wake us up early, and my brother and I would excitedly run to the picture windows in the living room, to look out and see the bunny (aka my poor dad who was roasting in his hot, furry costume) dropping eggs for our egg hunt. Lately, we’ve been doing Easter Sunday brunch at home, so we can just spend the whole day together, without having to rush off to a restaurant for dinner. Plus, I might be biased because I used to work in a restaurant, but I don’t think it’s fair that any restaurants are open on holidays. Everyone should get to be with their family or friends, not stuck working at a restaurant wishing they were celebrating with their family. Another reason I’m partial is because my mom is the best cook ever! Why go out to a restaurant for so-so food, when my mom always puts on the most amazing spread! I’ll be bringing my granola bird nests with Easter eggs, as my contribution to the buffet. What will you be doing on Easter this year? Any plans? These are the best ever chocolate chip cookies, and my mom finally shared the recipe with me! Chewy on the inside, crispy on the edges, and the best light crumb that only comes from using her secret ingredient! Sift the flour, sea salt, baking soda, and cream of tarter together into a large bowl. Set aside. Using a mixer, add the softened butter, and both sugars to the bowl. Beat on high for 2-3 minutes until completely creamed together. Add oil, milk, vanilla and the egg. Beat on medium until combined. Stir in the chocolate callets, walnuts and M&M's®. Using a tablespoon, scoop 2 balls into your hand and roll with our palms to smooth it out. Place the balls 2 inches apart on an ungreased baking sheet. 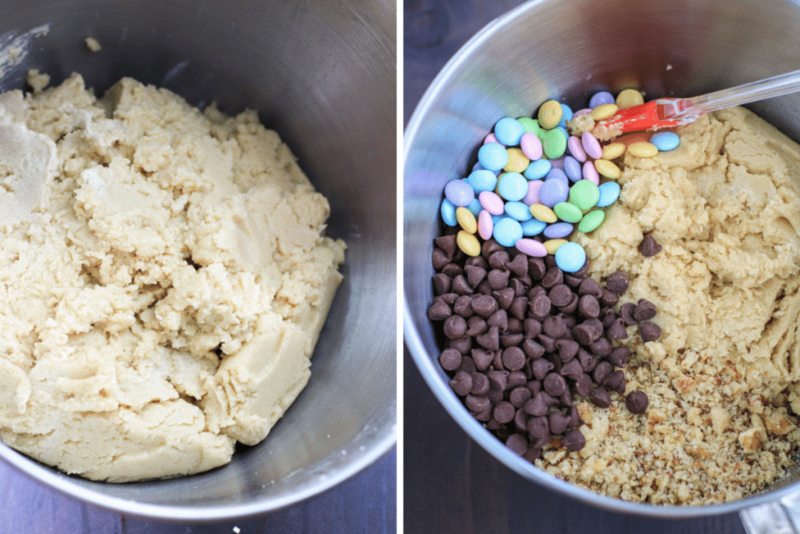 Top each cookie with a few more M&M's® and chocolate callets. Bake for 15 minutes, until the bottoms are lightly golden brown. Let the cookies cool on tray for 1 minute, then move to wire racks to continue cooling. I hope you all have a wonderful Easter holiday, that’s filled with love, fun, and cookies! What’s your favorite Easter basket treat? Let me know in the comments! I have to try the cream of tartar now, what a great tip and these do look like the best chocolate chip cookies ever! Thanks, Angie! My mom’s been holding out all these years, but she finally cracked and gave up her recipe and secret ingredient! They’re our favorite! You can never go wrong with chocolate chip cookies, yours look particularly delicious. Love the use of the M&Ms! Me too, Julie! Even after a few days, if you pop them in the microwave for 5-8 seconds, they get even softer and warm like they just came out of the oven! Heaven! Yum! I’m going to have to give these a try and see if they really are the best ever! Oh my goodness this looks so delicious!! I love m&ms in cookies 🙂 that’s my fav!! I love the colorful easter ones, it’s so festive! Cute post, your photos are amazing! Ahhh! These look AMAZING and I’m so excited to try them. They look adorable with the pastel M&Ms! Please thank your mom for me — my bet is she’ll have a lot of new fans! Chocolate chip cookies are one of my most favorite treats ever!!! 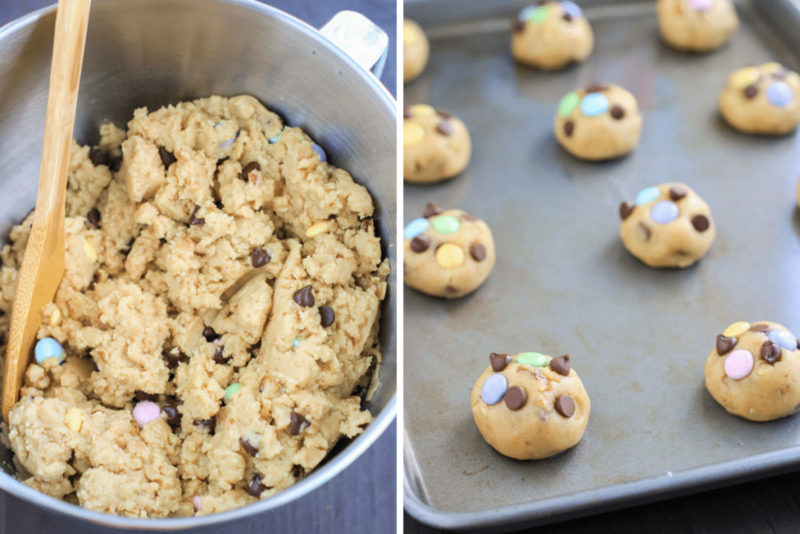 These look like the perfect chocolate chip cookie too! I’ve had certain recipes include cream of tartar before and you’re right, it does give most baked goods just a little something special! Thank your mom for being willing to share her delicious recipe with us…I will definitely be trying these soon! Yummmmm, can’t wait! Thank you Joscelyn! I’ll tell her you said that! She was a little reluctant at first, but eventually warmed up to it. Hehe. She wants everyone to enjoy delicious cookies!